* "The Garbage and the Flowers" is a line from the Leonard Cohen song SUZANNE, which is also about going down to a river, and about love. 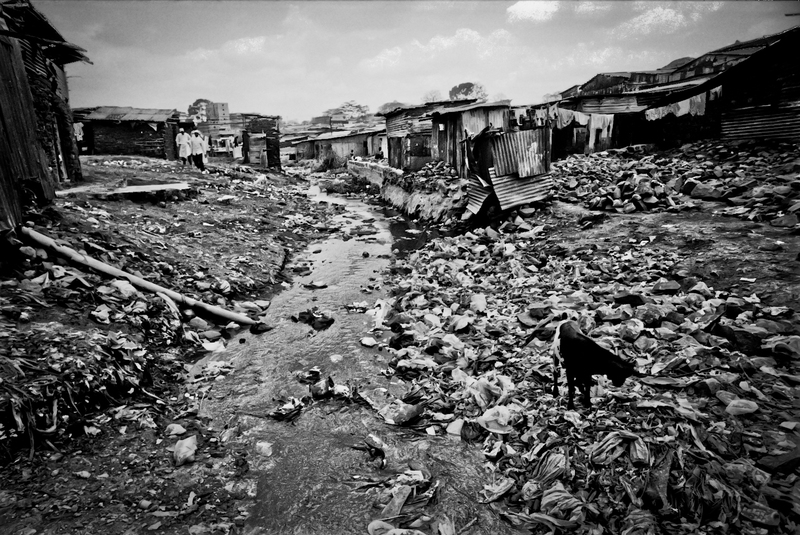 People of color trapped by policies and systematic injustice suffer the crushing poverty of Mathare slum in Nairobi Kenya and have few to no opportunities for work, education, health care, mobility, entertainment, recreation or food. Conditions of life and death here are some of the worst found on earth. 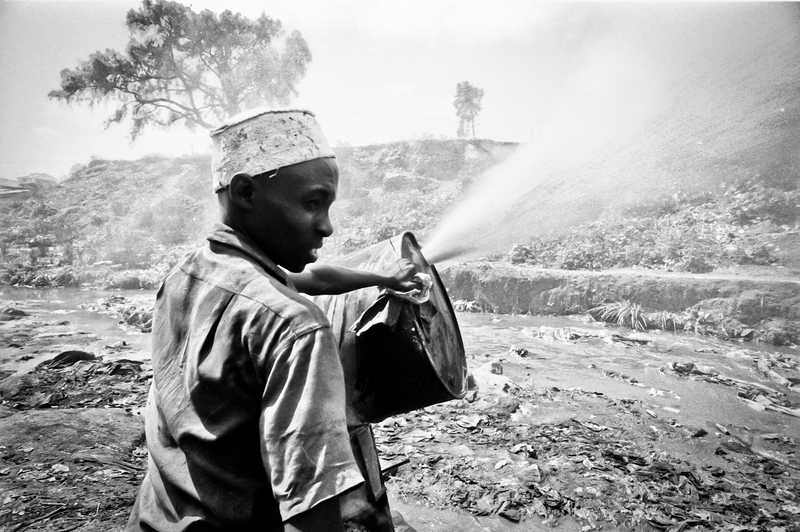 A boy vents the high pressure steam from a fermenting toxic moonshine (changaa) concocted in giant drums that sit next to the polluted river in Mathare Valley. For this boy and the men he is working with the fermented brew offers a chance to do something with his time, and the hope of turning idleness, apathy, frustration and despair into .... well, into something. 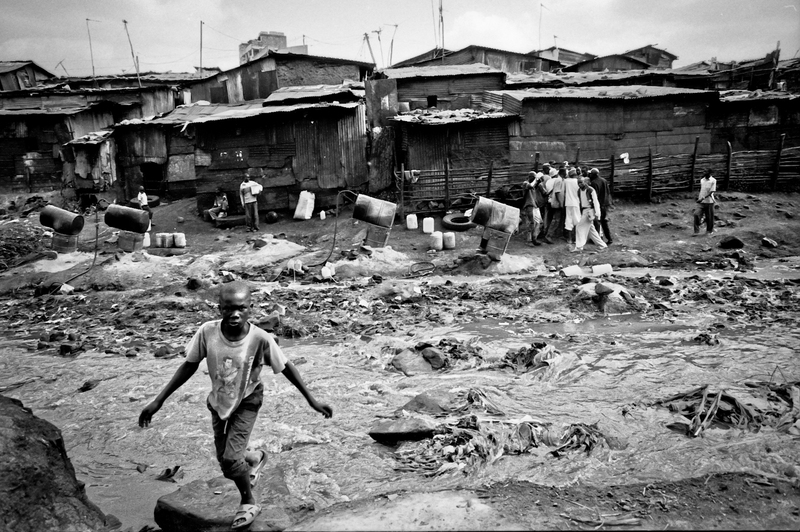 Mathare is one of Africa's oldest and largest "slums," with crushing poverty and destitution, with patchwork "homes", patchwork doors, fences, planks over open sewers, mud or wood plank walls, and flimsy rusted roofs. Forced or born into poverty here, people have few choices or opportunities. Amidst the garbage can be found hope, joy, beauty and love -- art and resourcefulness -- bespeaking the resilience of the human spirit. 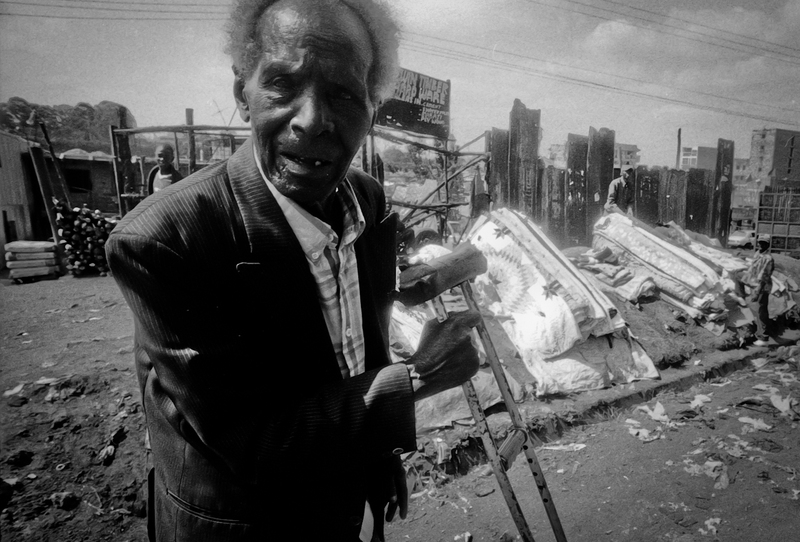 Under colonialism Nairobi became an Apartheid city segregating whites and people of color (Indians and Africans). 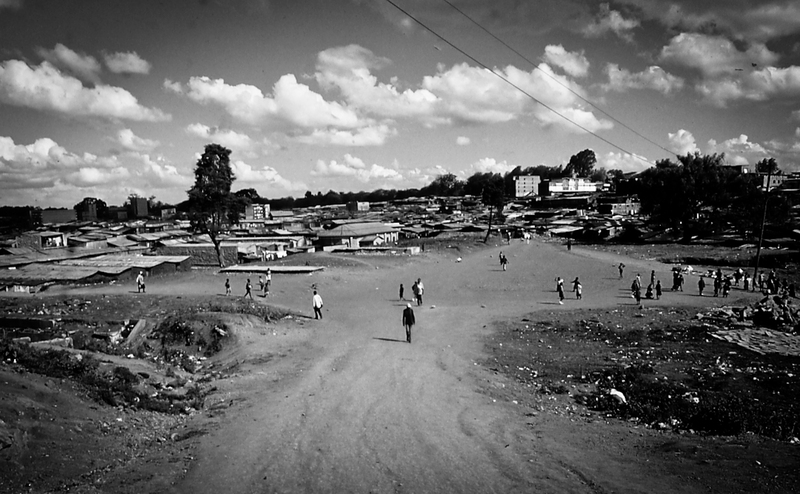 The racial disparities in Kenya and the "Quality of Life in Mathare" are stark: colonial policies maintained the spatial and racial segregation. Structural inequalities increased after independence (1963). 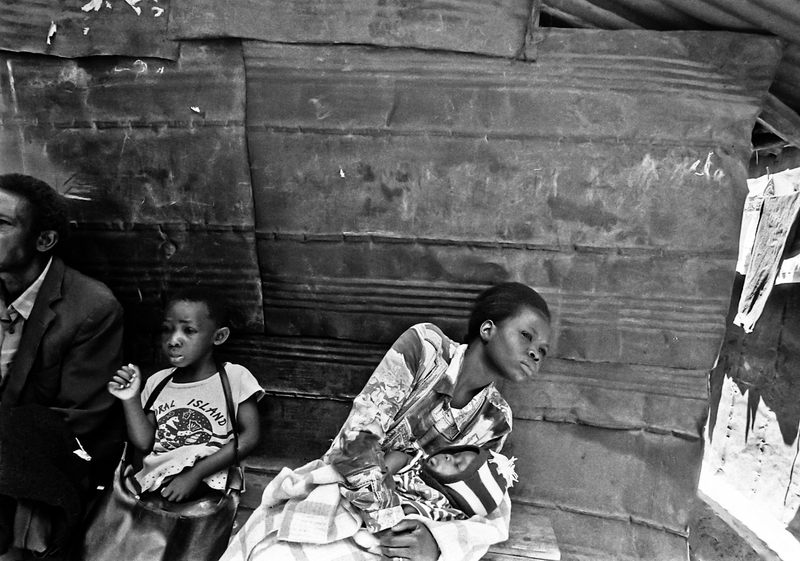 This exhibit offers scenes of daily life and struggle, while attempting to capture the apathy and the joy, the dullnes and fullness, the hopelessness and the creativity of the people -- whose human rights have been egregiously and systematically denied. As a visitor to Mathare I was made witness to the people's struggle, something for which I now feel some responsibility. 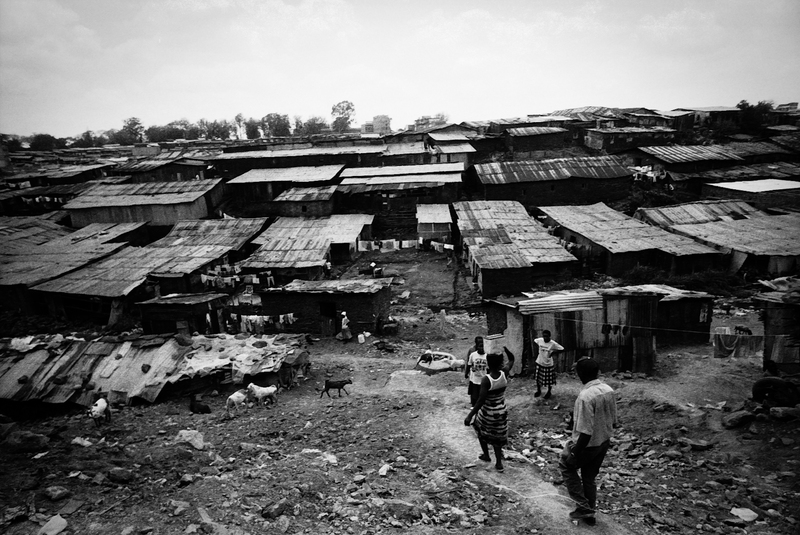 Corrugated metal roofs and dilapidated hovels sprawl across the expanse of Mathare, a city within a city (Nairobi), with some 600,000-800,000 residents. Mathare has makeshift shops with limited pitiful commodities, and there are barbers and hairdressers and clerks and health care workers all struggling to make sense of this life of near permanent misery. Gangs and all the usual violence found where people are denied all basic rights to life and the pursuit of happiness also thrive here. 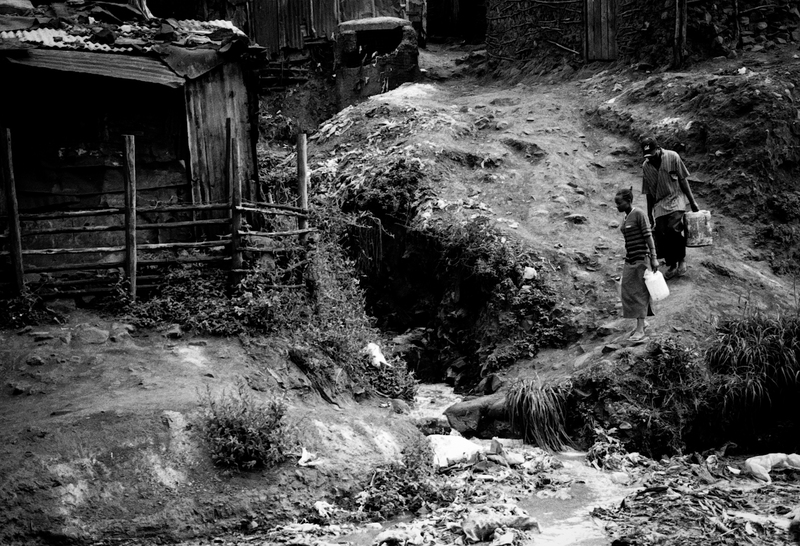 A young couple descends the steep banks of Mathare's trash-ridden and polluted ravine carrying water jugs... but sources of fresh clean water are few and compromised. Houses do not have water taps, and women are responsible for collecting water from a public tap. Hope, joy, laughter, love -- all can be found and shared in Mathare, attesting to the resilience and indefatigability of the human spirit. 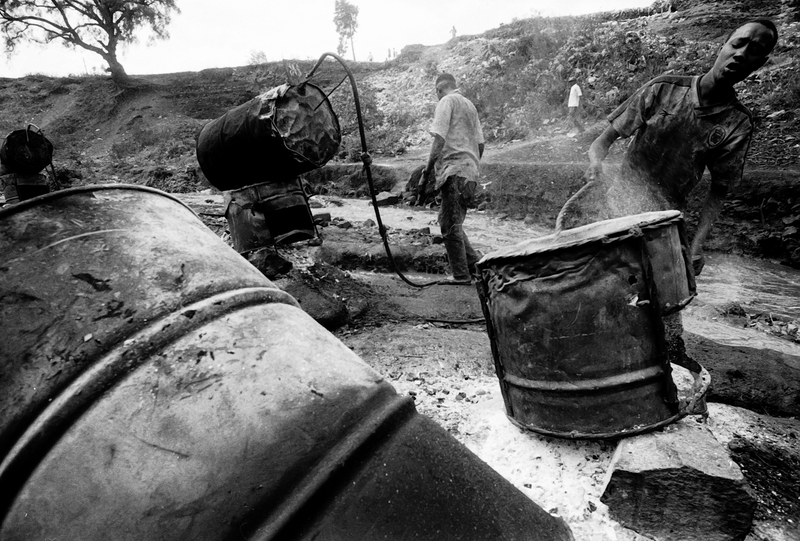 The bootleggers produce a toxic alcoholic moonshine (called "changaa") under very high pressure in these giant homemade barrel-drum stills. On the wall directly behind one barrel is the artwork (mural?) seen in the next photo. 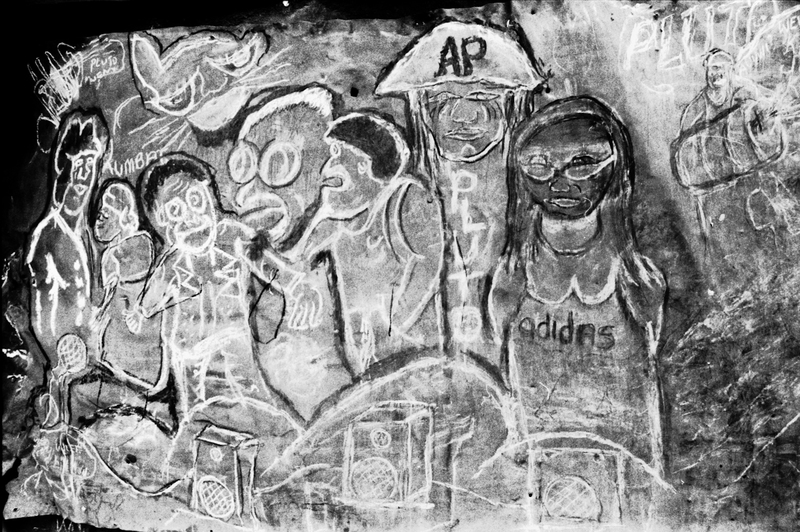 The mural painted or chalked on the wall of one wooden hovel bespeaks an awareness of globalization, advertising and branding. Note the AP (associated Press), and Adidas logos; the barrel drum still (right). The word PLUTO appears several times, apparently being the artist's name for the inhospitable otherworldliness of Mathare. The mural also bespeaks an intelligence: the people of places like Mathare are not incapable, nor lazy, nor dull. While some of them are rightfully angry at the condition they find their children and families forced to endure, they are also grateful, gratuitous, kind and welcoming. Their resourcefulness shows, and experience proves, that given opportunities equal to those afforded to any white child (anywhere in the world) they excel in creative genius, productivity and problem-solving. The grime, heat, filth, sludge and stench is shocking to the senses of anyone who comes from the "other world" of luxuries, commodities and artificial abundance. 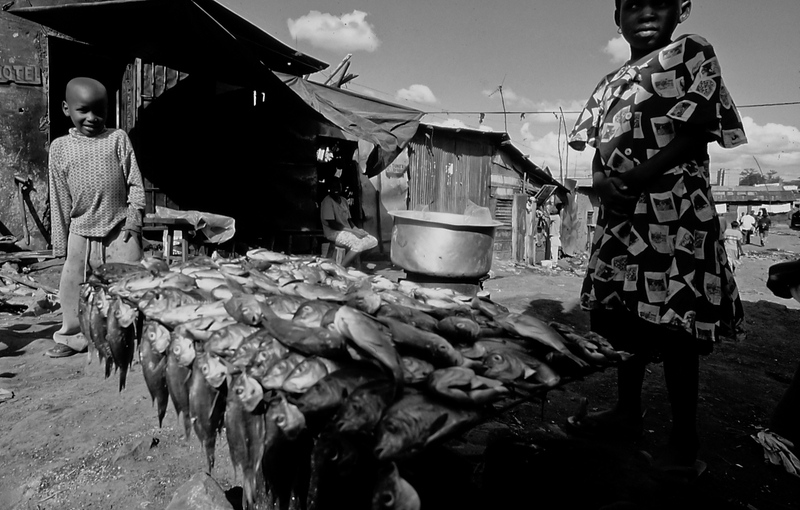 Few outsiders dare to venture into Mathare due to the high rates of crime and violence. The river that runs through Mathare Valley is so thick with pollution that it cakes onto the shoes of anyone who travels here. Mathare as a city within the city (Nairobi) grew up over many years on top of a garbage dump as more and more people were forced to settled there. It is a long strip of tin and wooden shacks and earthen walls constructed on both sides of the stream. 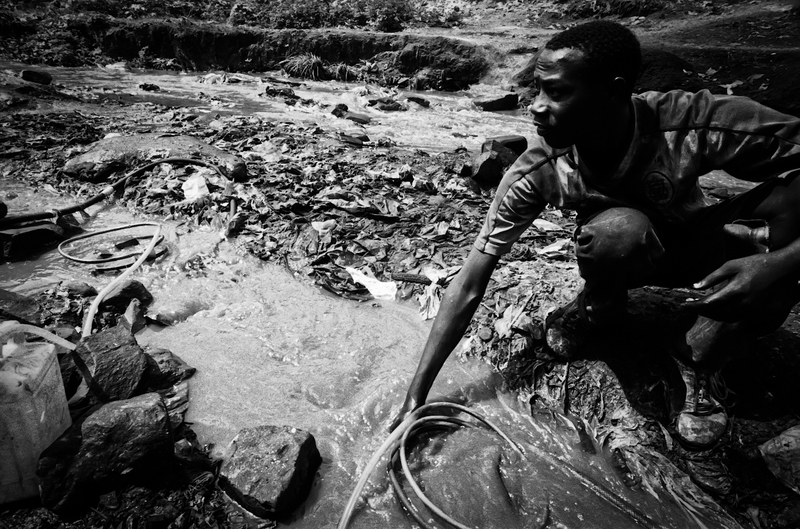 A man "cleans" a rubber hose used in the bootlegging in Mathare's polluted stream; clean water is a basic human right often absent in Mathare. Bootlegging in the Mathare Valley. 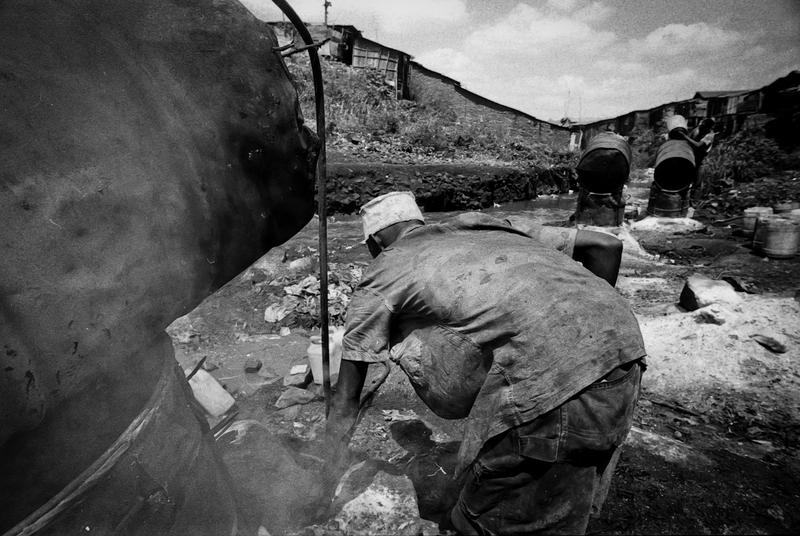 According to one infamous quote by a white man who has never challenged his own (conditioned) assumptions, beliefs, stereotypes, or explanations of why the world is the way it is: "Mathare Valley is referred to as the oldest and the worst slum in Africa … It is a place for criminals, drug addicts, the unemployed and prostitutes. Many people are afraid to visit here because the crime rate is so high." 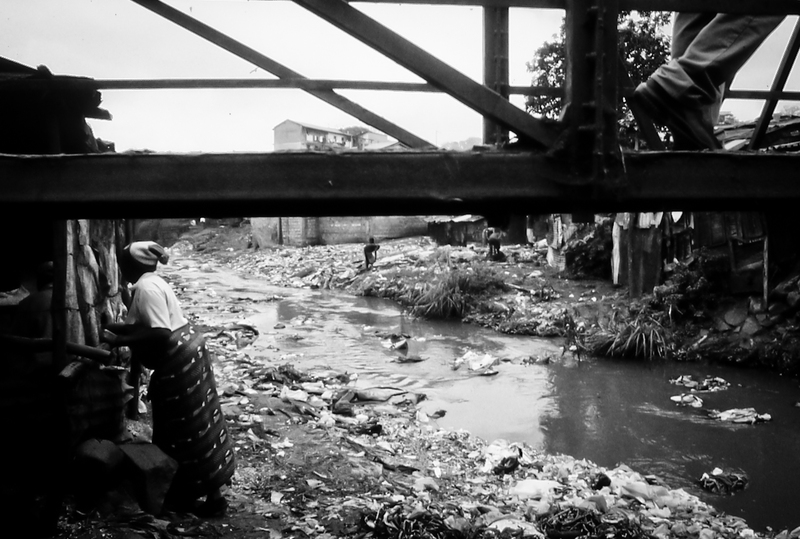 The bridge over Mathare's river is a steel and concrete superstructure that offers precious limited real estate that is used to hang clean laundry. With limited options for play and recreation, children play or languish on the (dangerous) steel bridge. 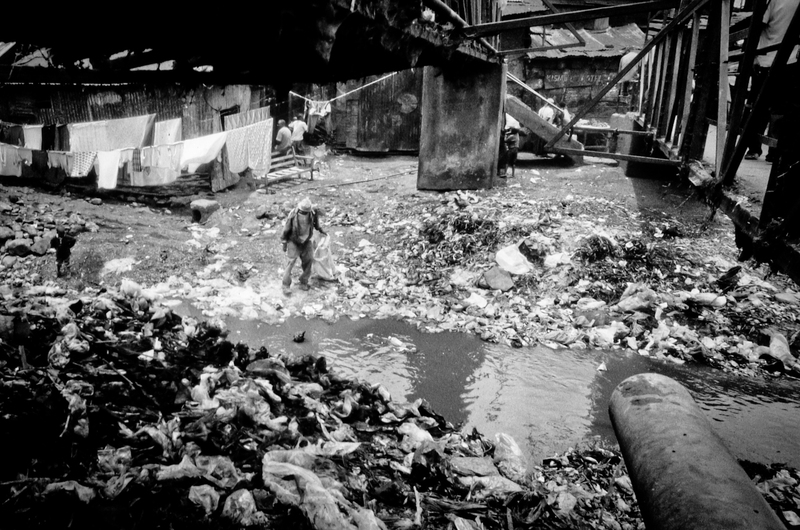 A giant outpipe dumps straight into the river that bisects Mathare, and desperate people frequently rummage amongst the garbage and no flowers seeking to recover anything that might assist their survival. In Mathare, there is no infrastructure for waste removal and garbage just piles up all over the area. Nairobi also does not formally provide any kind of waste removal services. 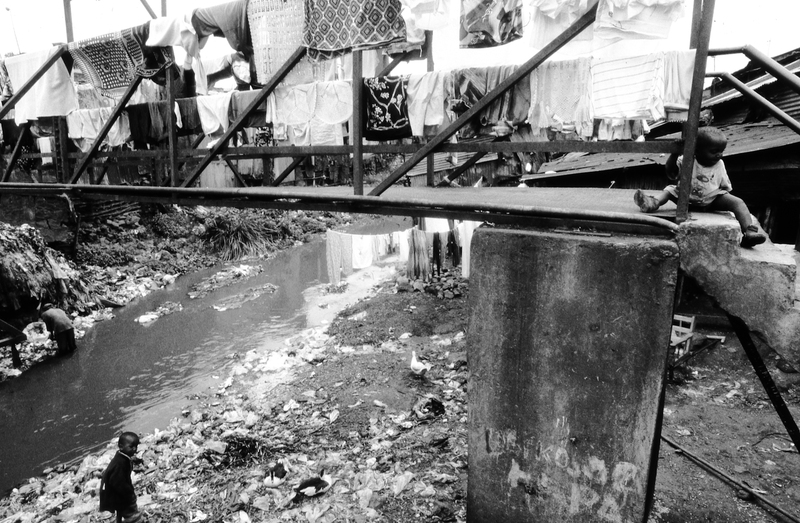 Misery is a fact of life in Mathare. A goat rummages for food and/or water along the tiny stream that divides Mathare Valley. 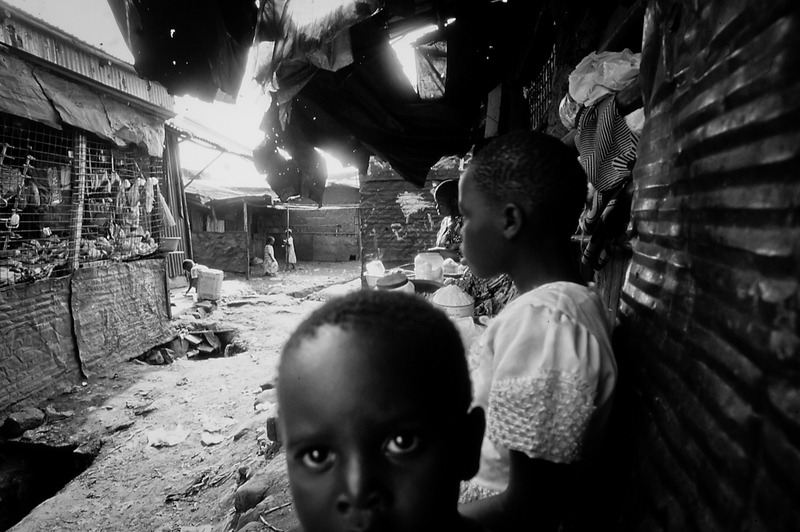 There is a restless hunger amongst the men, women and children of Mathare -- the hunger for justice, equality and help -- but hope and beauty can be found alongside desperation in the faces of the children, who are not yet conscious of the hardship that lies before them in coming years. 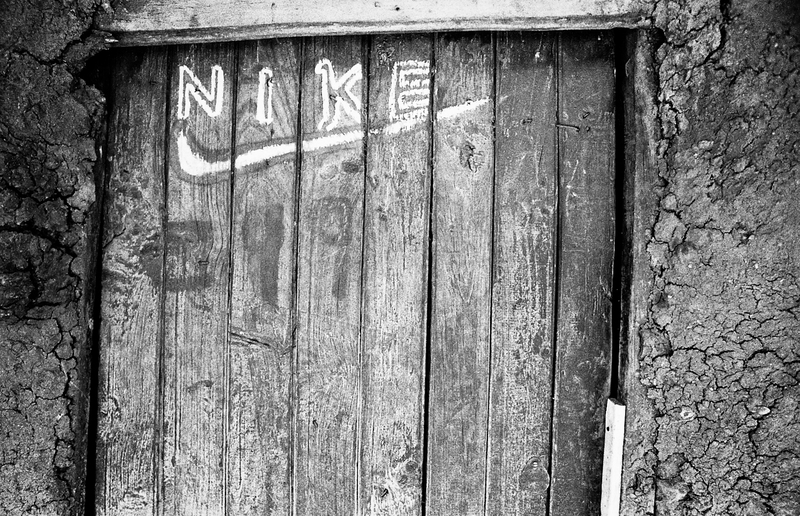 The attention and awareness of corporate branding can be seen in many places, speaking to what might be perceived as a hunger by some to have what they may never have.The Mathare environment is far from safe. 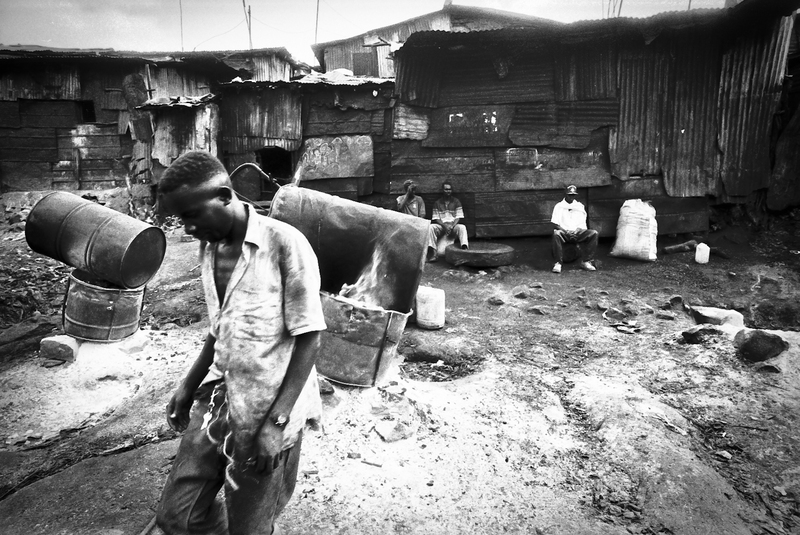 The houses in Mathare are connected by small streets and slim alleys. By late evening doors leading to these alleys are closed due to insecurity, and no one can either come or go from their homes. 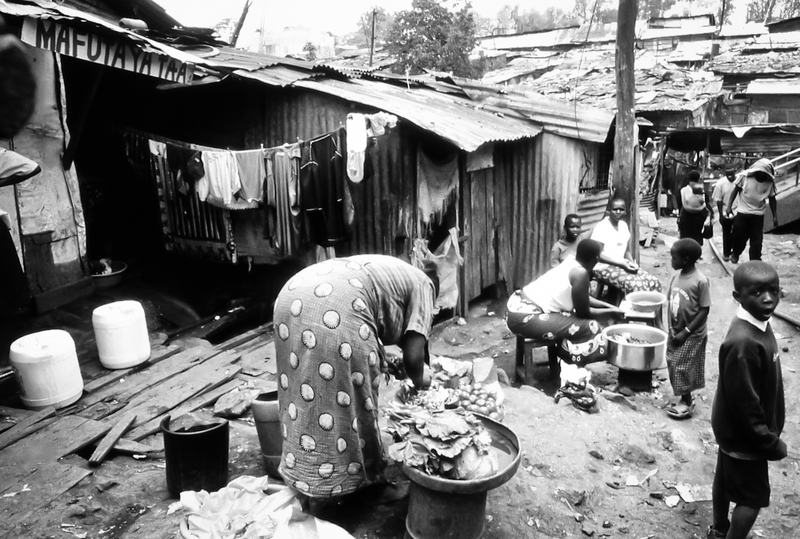 Women are responsible for all household chores in Mathare, and hundreds of thousands of women are totally impoverished and have no source of employment or means of gaining employment. The absence of sanitation, clean water, food, education all weigh heavily on women, who bear the burdens of a structural gender-based inequality on top of child-rearing and cooking and everything else. The look of this man speaks of his humanity, and it is a call for recognition of his basic human rights. Women and their children struggle to bring in any kind of income by selling anything they can accumulate, but the burden is crushing and impossible here. Men do not participate in street selling vegetables or food (tiny makeshift kitchens or grills offering snacks) becuase it is considered women's work. Food that is transported into Mathare is often and very quickly impossibly contaminated by the lack of hygiene and abominable health conditions, contributing to intestinal and digestive diseases, malnutrition, parasites, starvation and death, and innocent children are the most susceptible. 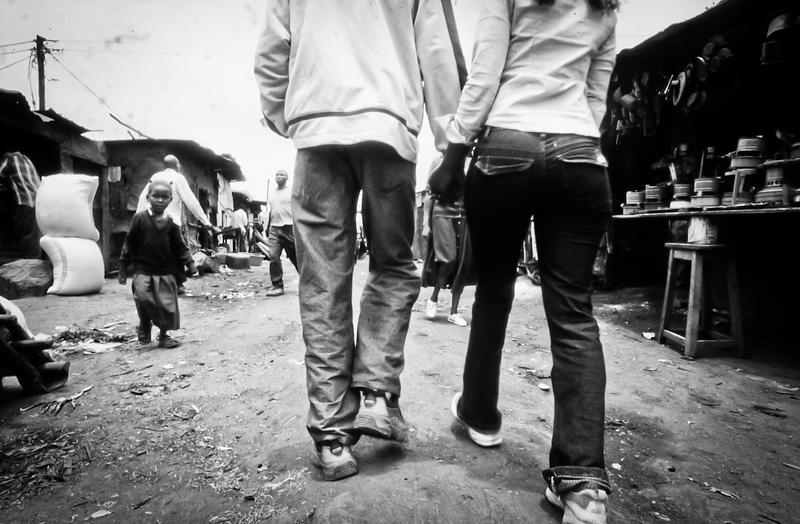 Mathare is accessed by foot from several sides, always heading down into the valley where the river flows. Few outsiders visit Mathare Valley. Residents suffer from varieties of a lack of freedom, such as the lack of access to basic services and confinements imposed by insecurity and racial segregation.